The overarching goal of the Child Rich Communities project is to grow a movement of people who think and work in community-led ways to improve child, family and whānau well-being. Read more in the About section below. Want to hear more about how people around the country are mobilising their community to improve child well-being? Watch our Child Rich Communities webinar series! Through three webinars we explored key practice principles that mobilise the community and improve child and family well-being. The webinars combined theory and experience, with community-based practitioners from diverse communities across Aotearoa sharing their experience. There was also space for questions and discussion on what’s making a difference for children and families. David Hanna from Inspiring Communities facilitated each webinar and presented on the Child Rich Communities framework. Each webinar explored in more detail a couple of the principles that make up the Child Rich Communities approach (see the principles in full below). At the end of the webinar series, all the principles were covered. Click on the links below to watch each webinar on our YouTube channel. Connect and Empower! The first webinar explored the principles of engagement, empowerment and connection. Julia Milne (Common Unity) and Steve McLuckie (Shore to Thrive) presented. Watch it here. The big picture. The second webinar explored the principles of thinking and working holistically and being responsive. Ginny Larsen (Mairehau Neighbourhood Trust) and Jane Denley and Adam Rivett (Waimate Parenting Hub) presented. Watch it here. It’s all about relationships. The third webinar explored the principles of being relationship focused and the importance of collaboration. Lisa McKenzie (Hokonui Highway Project) and Erena Mikaere Most (Ruapehu Whānau Transformation Plan) presented. Watch it here. The Communities of Practice aim to support those already working in community-led ways. Through peer learning, in groups of 6 – 8 people, we aim to strengthen everyone’s confidence, skills, knowledge and build ongoing local support networks. Currently, we have three communities of practice operating: one in Wellington, one in Christchurch and two online. If you’d like to know more, contact us. These workshops explored what a Child Rich Community (CRC) is, what the CRC practice principles are all about and how local people and organisations can work together to support the development of CRC thinking and practice locally. To enquire about future workshops, please contact us. 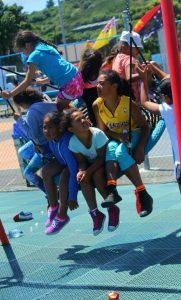 The Child Rich Communities project is about growing a movement of people who think and work in community-led ways to improve child, family and whānau well-being. It’s well known that here in Aotearoa there are big issues when it comes to the wellbeing of our children. We think one part of the jigsaw is changing not just policies, but how we approach issues. It seems clear that the way we’re addressing issues isn’t always working: many of the big issues have been with us for a while, through successive governments, different policies and multiple reforms. So where do we go? Well, as the quote goes, you can’t do the same thing over and over again and expect a different result. So how about we focus on doing things differently? Rather than top-down approaches, we believe big change comes from supporting communities to lead. This means supporting communities to decide what solutions will work best for them, sharing power, decision-making and resources to enable locally-led responses and action. This is what Child Rich Communities are all about. There is no single model or definition for what a Child Rich Community is. Rather it’s a way of working that is driven by a set of principles that enable people in local places to make positive changes for themselves, their children, their family and the wider community. A movement takes people, so this is where you come in! We’re currently focused on raising the profile of Child Rich Communities and supporting and connecting like-minded people, organisations and initiatives across Aotearoa so that we can all learn from each other. Learn more by reading the Child Rich Communities Principles. You can download them too. Click to read The Child Rich Communities Principles. Interested in taking part? Get in touch! Check out locals leading change in their communities. Hear their stories and share their insights into the rewards and challenges of using community-led approaches to support children and families. You an also check out our Bright Spots webinar from 2017. In this webinar, we examined three lessons that emerged from the Bright Spots report. Lizzie McMillan from Wesley Action Waitangirua and Jenny Jurgens from Whanganui Central Baptist Kindergarten provided great case studies to demonstrate these learnings in practice. Here’s some more information on the background of the project, how we went about it and where we are at now. In the past few years, there has been increasing concern about child poverty in New Zealand. The agencies behind this project noticed that the responses to struggling children tend to fit within two strands of work – lobbying and advocacy and targeted intervention by Government, NGOs and the private sector. Both of these strands of work are important. However, there is another strand of work that is not always so visible, but is equally important – there are many people working in community-led ways throughout Aotearoa New Zealand. And this work is improving the lives of children and their families. The aim of this project is to connect and learn from these ‘Bright Spots’ and build support for the role of community led development in child wellbeing. In early 2015 the organisations – Inspiring Communities, Plunket, UNICEF and Every Child Counts – came together to begin a project to explore local community initiatives that are making a positive difference to children and families. To kick-start this project, a report was commissioned to explore Bright Spots across Aotearoa New Zealand. A total of 21 initiatives ranging in size and scale, age, geography and entity type were engaged to learn more about their success factors. Stakeholders from philanthropic and government sectors were also interviewed. Following the release of the report, the project team asked Bright Spots if there was interest in continuing to grow the project. The response was positive, so a hui was organised in November 2016 for the Bright Spots to get together. The aim was to continue learning from one and another and to discuss where to from here for the Child Rich Communities project. We have gratefully received funding from S.K.I.P to resource some of the actions from the hui. The funding enables us to hold three new webinars, three regional training workshops and set up four new regional ‘communities of practice’ aimed at peer-led support for those active in the community-led development/child well-being space. While this new funding is specific to these activities, we’re keen to continue work on the wider aim of the project to raise awareness, deepen understanding and promote the role of community-led development in child and family well-being. A movement takes people, so this is where you come in! 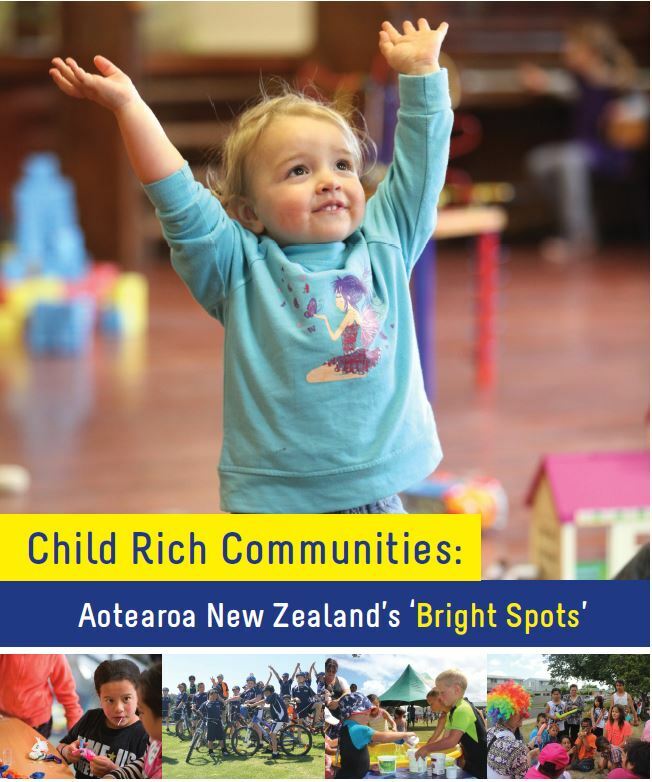 We’re currently focused on raising the profile of Child Rich Communities and supporting and connecting like minded people, organisations and initiatives across Aotearoa so that we can all learn from each other. If this sounds like something you’re doing or interested in, get in touch! Does this sound like something you’re interested in? Get in touch and join us. Or if all of this sounds like what you’re currently doing in your community, we’d love to tell your story. Drop us a line! Contact – Lisa Woods, lisa.woods@inspiringcommunities.org.nz, 021 1228 273.